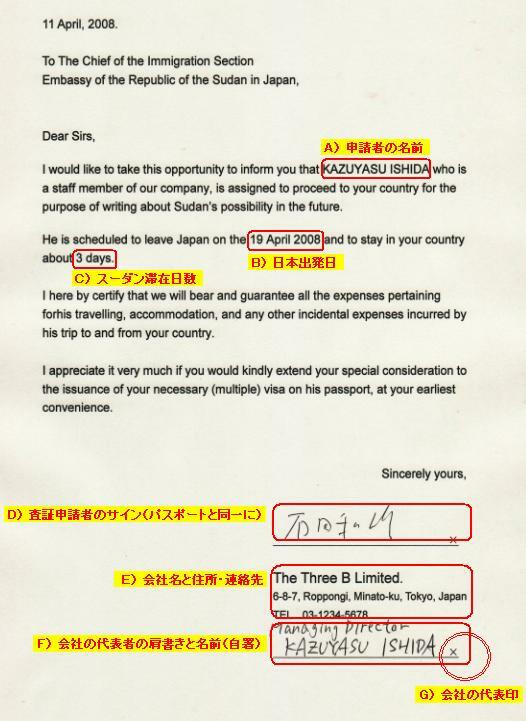 I would like to take this opportunity to inform you that ****** ******　who is a staff member of our company, is assigned to proceed to your country for the purpose of writing about Sudan’s possibility in the future. He is scheduled to leave Japan on the **, **, **** and to stay in your country about ** days. I here by certify that we will bear and guarantee all the expenses pertaining forhis travelling, accommodation, and any other incidental expenses incurred by his trip to and from your country. I appreciate it very much if you would kindly extend your special consideration to the issuance of your necessary (multiple) visa on his passport, at your earliest convenience.